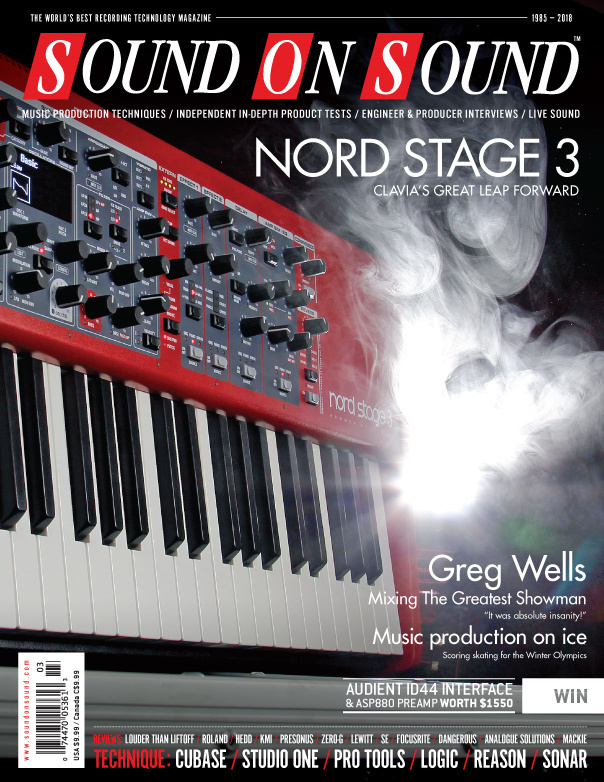 Reviews: Clavia Nord Stage 3 (Cover), Roland TR-08, HEDD Type 20, Audionamix Xtrax Stems, Lewitt LCT 540 Subzero, Focusrite Clarett USB, Eventide MangledVerb. Technique: Making Modern Metal: Part 3, The Sampled Orchestra: Part 9. Creating A Music Programme For Ice Dancing, Live Sound On The High Seas, Inside Track: Greg Wells. Analogue Solutions introduce their new SynthBlocks range with two highly individual devices. RZ062 is a faithful recreation of a valve EQ that was made by Siemens in the 1950s — or rather, of two different valve EQs, because Audified have modelled both ‘A’ and ‘B’ versions of this processor as separate plug-ins. Audionamix’s easy-to-use Mac utility promises to separate any music track into drums, music and vocals. MusicLab’s latest update makes RealGuitar more real than ever. For anyone regularly needing to mic a grand piano, the Mirizio Microphone Mount is a very elegant and cost-effective solution. sE Electronics’ affordable new pencil mics prove themselves more than capable on a wide range of sources. Zero-G’s new library makes it easy to add a touch of Middle Eastern flavour to your productions. With a title like Heavy Industry, it will perhaps come as no surprise if Zero-G’s latest offering is intended to take the user into the sonic realms of the urban, industrialised world. If you like to explore different versions of a song (or just have difficulty making your mind up!) Cubase’s Track Versions have a lot to offer. Make mono guitars monstrously wide with Logic Pro X’s Dual Mono features and Track Stacks. Sounding Off: Is Bigger Better? Is bigger always better... or just bigger? Read more about Sounding Off: Is Bigger Better? We discuss another handful of hit records, to help you brush up on your listening skills. This month: Cardi B • Rak-Su • Eminem ft Ed Sheeran • Classic Mix: The Animals ‘House Of The Rising Sun’ (1964). Read more about Q. Can I set vocal levels using clip gains? Read more about Q. How can I locate the masking problems in my mix? Media content for the March 2018 issue.